And you thought Samsung was finished showing off its Series 7 line of PCs. Joining the gaming rig and its smaller laptop brethren is a brand new Series 7 Slate running Windows 7. It sports a 400 nit, 1366 x 768 11.6-inch capacitive panel, Intel's 1.6GHz Core i5 2467M CPU with integrated graphics and 4GB of RAM. On the front there's a 2 megapixel camera and a light sensor, and around the back sits a 3 megapixel shooter. Connectivity comes courtesy of 802.11 b/g/n WiFi, plus there's a USB 2.0 port, micro HDMI, and a SIM slot for surfing waves of 3G (no word on which carrier will send those swells of data, though). Each slate also comes with an capacitive active digitizer pen, but will also have Swype on board plus a custom software layer to make Windows a bit more finger-friendly. It comes in four versions that differ in storage size and flavor of Windows, but all are .5 inches thin, weigh 2.03 pounds, and are swathed in brushed aluminum. There are 64GB SSD variants packing Home Premium for $1,099 or Pro for $1,199, while the 128GB models come with Home Premium, a dock and keyboard for $1349 or Pro sans the peripherals at the same price. They're all scheduled for a late September release, so it won't be long before you can pick one up. 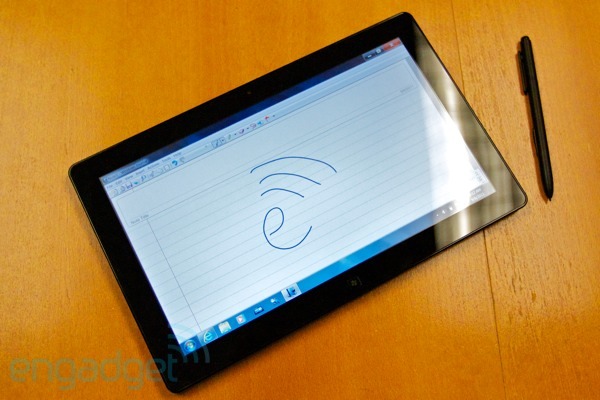 Looking to take the tablet plunge into Windows waters? Read on past the break for our impressions of Sammy's new slate. We got to spend some time with Samsung's newest slate, and we found it to be an intriguing device. We were impressed by both the display's brightness and its responsiveness to finger swipes and taps. The stylus also worked quite well, as the screen picked up its movements once the tip was half an inch from the surface. Plus, there was a little diamond indicator that popped up and tracked the pen's movements to aid the accuracy of our taps. We didn't get to delve too deeply into the custom software layer Samsung installed, but we can say that the larger icons and swipe-able screens made for an experience familiar to any iOS or Android user. We also got to see the optional dock and keyboard, and thought both of them to be worthy additions to the tablet experience. The dock, which has HDMI, Ethernet and USB ports, has a solid heft to it, and is coated in the same brushed aluminum as the slate itself. 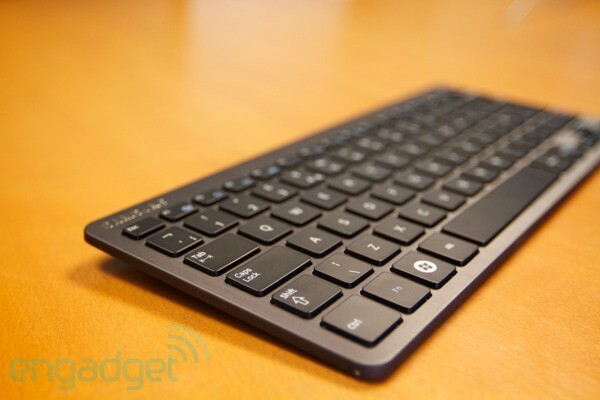 The Bluetooth keyboard is razor thin, and the keys were satisfyingly clicky. Overall, we can see the appeal here -- tablet portability with full Windows functionality. However, at such steep prices, we'll have to wait and see if folks just buy a netbook and a Galaxy Tab 10.1 or an iPad instead. Dante Cesa contributed to this report. RIDGEFIELD PARK, N.J., September 1, 2011 – Samsung Electronics America Inc., a subsidiary of Samsung Electronics Co., Ltd., today announced the Series 7 Slate PC, a lightweight slate computer with full PC capabilities running Windows® 7, at the IFA global consumer electronics tradeshow. The Series 7 Slate PC offers all of the features of a full-sized laptop in an extremely portable package, providing highly mobile users with the computing power they need for maximum productivity anywhere they go. "The Samsung Series 7 Slate PC was designed for on-the-go users who need a slim, lightweight computer but can't afford to sacrifice true PC functionality," said Scott Ledterman, director of mobile PC marketing at Samsung Enterprise Business Division. "Whether you're using it for work or play, the Series 7 Slate revolutionizes portable computing by providing the latest and greatest PC features without weighing you down." "The Samsung Series 7 Slate PC is a great example of the commitment Samsung has to continued innovation with Windows," said Nick Parker, Vice President of Worldwide OEM Marketing at Microsoft Corporation. "With full-PC power packed into an ultraportable device, the Series 7 Slate PC takes mobility to a new level with an innovative touch-focused design that transforms personal computing and enables richer experiences." Weighing less than two pounds and measuring only half an inch thick, the Series 7 Slate can truly be taken anywhere. Despite its compact size, the Slate is a full-powered PC with a 11.6-inch screen, powerful Intel® Core™ i5 processor, a full version of Windows® 7 Home Premium or Windows® 7 Professional operating system and an up to 128 GB* solid state hard drive, meeting the needs of even the most demanding power user. Users can quickly type using the on-screen keyboard and navigate through the slate's features with the highly responsive capacitive multi-touch screen, or write naturally on the screen using an electromagnetic pen, making it easy to take meeting notes, create documents and reports in Microsoft Office 2010, or browse online. An integrated microphone and dual 2MP (front) / 3MP (rear) cameras can record audio/visual files, which can be stored and shared via the full-sized USB port or Wi-Fi, WiMAX and HSPA connection. The Series 7 features Samsung's exclusive FastStart technology, which enables the slate to transition from a hybrid sleep mode to full functionality in two – three seconds, enabling users to quickly jump into work or play anywhere. Samsung's touch interface helps to streamline your life by providing seamless access to applications used every day such as Facebook, Twitter, maps and media content. The Series 7 Slate was designed to impress. In addition to being easy to transport, its sleek, slim design and elegant detailing will turn heads everywhere, from the boardroom to the train on your commute home. The Series 7 Slate screen features vivid Samsung Superbright Plus Technology (400 nit), as well as a vibrant 16 million color range, making it ideal for viewing everything from presentations to photos or videos. The wide 170 degree viewing angle makes it easy to view content from anywhere, as well as to display materials to friends and colleagues. An optional Bluetooth keyboard, docking station and mouse add further convenience and create a desktop PC experience for business users planning to settle in at a desk while traveling. The docking station replaces the traditional desktop by providing the interface and computing power; it also gives users the flexibility to sync up to a larger monitor for even more efficient multitasking. Samsung's exclusive Easy Settings make it effortless to connect the Series 7 Slate to new wireless networks, projectors and more by giving you easy access to commonly used PC settings, resulting in stress-free business travel and presentations. Samsung Easy Migration allows users to seamlessly transfer existing files by connecting their old PC to the Series 7 Slate, launching and starting Easy Migration and letting the PC do the rest. With up to seven hours of battery life*, the Series 7 Slate ensures an all day connection for optimal productivity while on-the-go. The inclusion of Samsung Power Plus technology means that the Series 7 Slate battery will retain 80 percent of the original battery capacity for up to 1,500 charges – giving users a battery that works whenever and wherever they need it, even after three years of use. The Samsung Series 7 Slate is scheduled to be available starting October 2, 2011. The MSRP is $1,099 – $1,349. All Samsung mobile PC products are available through Samsung resellers and distribution channels. For a full list of retailers, call 1-800-SAMSUNG or visit www.samsung.com. *Battery life will vary depending on the product model, configuration, power management settings, applications used, and wireless settings. The maximum capacity of the battery will decrease with time and use. Test results based on independent third party Mobile Mark tests. Non-Metric weights and measurements are approximate. Total amount of available memory may be less based on configuration.